Featured amenities include a 24-hour business center, express check-out, and complimentary newspapers in the lobby. Planning an event in Nusa Dua? This hotel has facilities measuring 3541 square feet (329 square meters), including conference space. A roundtrip airport shuttle is provided for a surcharge (available 24 hours), and free valet parking is available onsite. 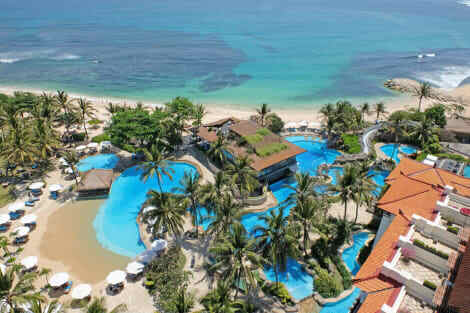 Hilton Bali Resort is situated in the southern part of Bali, in the prestigious Nusa Dua area, 20 minutes’ drive from Ngurah Rai International airport. 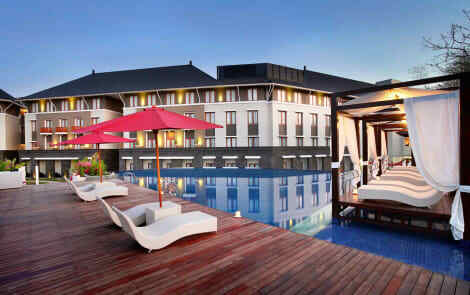 The resort is only a few minutes’ drive from Bali National Golf Course and Bali Collection shopping center. The new Bali Mandara Toll Road is within close proximity, connecting Nusa Dua to lifestyle centers of Kuta and Seminyak as well as the capital of Bali, Denpasar.Sitting atop a 40-meter cliff, with stunning views of the Indian Ocean, Hilton Bali Resort offers 407 well-appointed rooms, suites and luxurious villas. The resort is famous for its breathtaking sights from the majority of its rooms, extensive lush gardens and one of the most picturesque secluded beaches on the island. Take things down a gear and relax on our secluded white-sand beach with private cabanas and sun loungers. Enjoy an array of recreational facilities including four interconnecting pools, three covered tennis courts, a fitness center, sauna, steam room, and outdoor cold and hot jetted tubs. Unwind with a pampering treatment at Mandara Spa while the kids are entertained with our children-friendly facilities including a Jungle-themed Kids Club, a kids pool, waterslides and a sand lagoon. Dining options are represented by six restaurants and bars specializing in Japanese, Balinese and international cuisine. Separate upgraded facilities are offered for executive-level guests.Whether you look to host 20 friends or 1,500 conference delegates, Hilton Bali Resort has the perfect venue. Select from a variety of indoor and outdoor options including two conference venues with two ballrooms for up to 1,500 people; 14 breakout rooms, multiple pre-function areas, event lounges, plus separate arrival and check-in areas. The resort’s ocean-facing wedding chapels are set against the dream-like surroundings, ideal for weddings and vow-renewal ceremonies, while our private villas are great for honeymoons and romantic getaways.